Sheldon is the one who will be playing tag with the kids, going down the water slide with the boys, and eating ice cream with the elderly man at the picnic table. He loves to have fun and looks for the moments of joy that life brings us. He’s relational to his core, and simply put – he loves people. Sheldon is originally from Greenfield, Indiana, and is married to his wife, Beth. They are blessed with 4 kids: Bryant, Brittany, Garrett and Karissa. They are all adults, but will always partially be kids since they have the “Callahan gene.” Sheldon is a nature man, and comes alive not just when he’s enjoying the outdoors, but working in it. He’s a beekeeper, a bird watcher, and taps maple trees for that wonderful thing called syrup. I guess some would call him old fashioned, but they would be right… because he appreciates the discovery of what nature offers us. 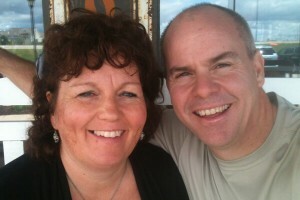 At Vineyard, Sheldon is the pastor of Healing & Family Ministries. He oversees marriage & children, as well as prayer & healing which has a focus on encountering God in all aspects – soul, body & spirit. He’s passionate about helping others experience God’s love, and then equipping them to help others do the same. He’s that one guy in the movie theater that will laugh louder than everyone else, and then make you laugh… because he’s a kid at heart, and he just can’t help it.